Huzzah! More notes to self, please!! Just wanted you to know I just got done reading every one of these comics, and loved every one. Keep doing this, even if you feel pressured to discontinue. Actual events? 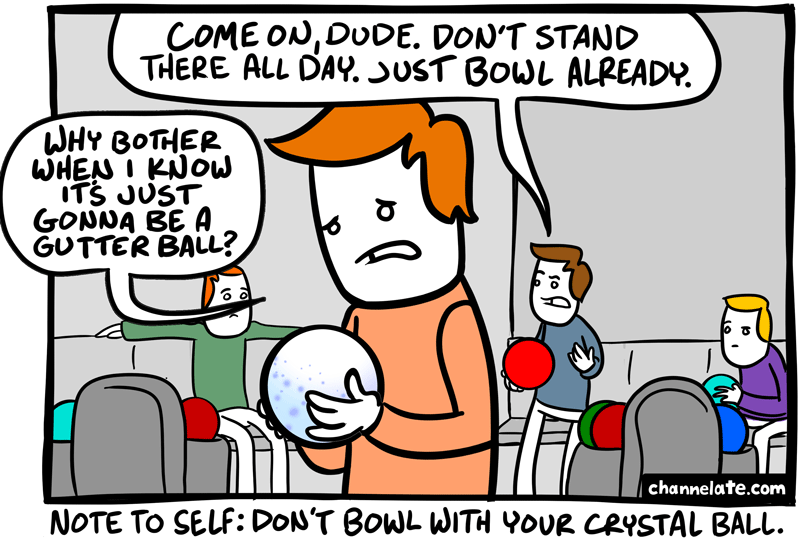 Cool… Wish I had a Crystal Bowling ball. Yes. Another great comic. You, Cyanide and Happiness, and many flash artists have inspired me to pursue a career in the media arts (a.k.a. cartoonist). I already have some comic strip ideas. Come on now, man! Get your head out of the gutter! Hahaha… brilliant! But if he doesn’t bowl, then the crystal ball will be wrong and it’ll break reality! Or at least discredit the ball as a reliable oracle. For some reason the part where Neo meets the Oracle and then breaks the vase comes to mind. I know this web page offers quality based posts and extra data, is there any other web site which gives such information in quality?